The occasional knee-jerk reaction aside, U.S. equities continue to largely brush off trade-war fears. That isn’t the case for Chinese, emerging market and European stock markets. Analysts at UBS looked at days when there has been a “trade shock,” which they define as a day on which their list of 115 global equities most exposed to trade tensions underperform or outperform the MSCI ACWI index of world stocks by 0.5% — something that’s happened 24 times since March. 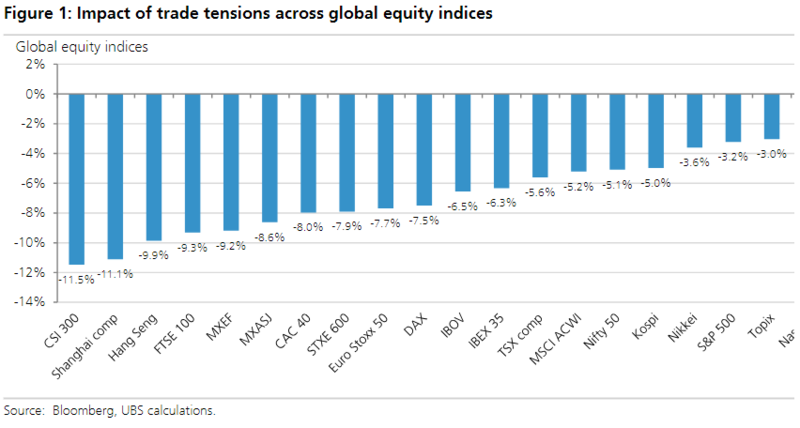 They then stripped out the price action during those days and used the difference between the actual and “shadow” (free of trade shocks) price indexes to estimate the drag that tensions have had on equities around the world, as reflected in the chart below from a Wednesday note. The results show that Chinese equities have felt the brunt of the trade tensions, with concerns knocking 11.5% off the CSI 300 and 11.1% off the Shanghai Composite Index SHCOMP, -0.18% The CSI 300 is a capitalization-weighted index that mimics the performance of the 300 most-highly valued stocks in the Shanghai and Shenzhen exchanges. The CSI 300 and the Shanghai Composite both fell into bear market territory earlier this year, commonly defined as a fall of 20% from a recent peak, while Hong Kong’s Hang Seng Index HSI, +1.01% met the criteria on Tuesday. The UBS analysts estimate that the Hang Seng, of which 50 components are mainland Chinese companies, has suffered a nearly 10% hit from trade woes. The S&P 500 SPX, +0.00% however, has suffered only a 3.2% drag from trade concerns. The U.S. benchmark, which had suffered a correction in February before trade tensions began to mount, returned to record territory in late August and is up more than 8% in the year to date. Trade woes have been a drag of just 2.5% on the Nasdaq Composite COMP, +0.18% and only 0.3% on the more domestically focused, small-cap Russell 2000 RUT, -0.05% the analysis found. The next big event will be the formal U.S. announcement of tariffs on a further $200 billion of imports from China, the analysts said. UBS economists are penciling in a 10% tariff but see risks of a 25% rate or broader tariffs, the analysts said. Indeed, President Donald Trump on Friday warned that the administration was weighing import duties on an additional $267 billion of goods. China has vowed to continue retaliating on U.S. tariff moves. On the optimistic side, The Wall Street Journal reported Wednesday that the U.S. had approached China regarding a new round of trade talks, in an effort to give Beijing an opportunity to address Washington’s trade concerns before the Trump administration imposes more tariffs. UBS previously cut its forecast for fourth-quarter U.S. economic growth to a 1.6% annualized rate and a higher tariff could prompt them to cut it to below 1%, the analysts said. After Fed selloff, is a U.S. bear market next?